Over 1100 pages covering virtually everything about alternative cancer therapy. A thoroughly researched analysis of the medical system in the USA. Gives the reasons behind the opposition to Laetrile and other proven non-toxic treatments. by Philip E. Binzel, Jr., M.D. An impressive collection of success stories of patients who beat cancer using Laetrile. Gives Dr. Binzel's ongoing battle with the medical establishment. A powerful expose of medical politics focusing on Harry Hoxsey, who developed an herbal concoction for treating cancer. Over 300 tasty recipes rich in the cyanide containing substance that many scientists believe is nature’s control for cancer: Vitamin B17. Prevent and Cure Cancer by Eliminating the Cause - Infections and Injury. by David J. Hess, PhD. Helps you make informed decisions when evaluating alternative cancer therapies. Safe and effective natural methods to improve outcomes for cancer patients. The Immortality Enzyme, by Dr. Minton, reveals the secrets of biomedical breakthroughs that you can use to fight aging and cancer. Foods, exercises, and attitudes to keep your breasts healthy. 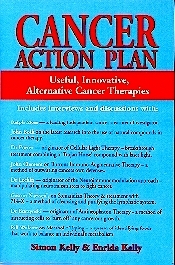 Very well structured to provide easy access to practical information on a wide range of alternative cancer therapies. Contains names and addresses of sources for various treatments and substances. May bedownloaded directly from the publisher. Historic struggle between orthodox and alternative medicine. The story of Harry Hoxsey, who used an herbal combination to treat cancer. A thoroughly researched analysis of the medical system in the USA. It gives the reasons behind the opposition to Laetrile and other proven non-toxic treatments. By G. Edward Griffin. Explains why surgery, drugs, and radiation have become the treatment of choice for cancer, and why non-drug alternatives are often branded as quackery. For more information. by G. Edward Griffin This is the soundtrack of the film based on his book.For more information.